I can honestly say that I am dancing in my seat about blogging this wedding! Amelia and Adam’s Scripps Seaside Forum Wedding took place waaaaaayyyyy back in June of 2012. I waited to so long to blog this because it was featured in the print version (and online version) of Exquisite Weddings Magazine! I fell in love with Amelia during our very first meeting, and was so excited to work with her and Adam. 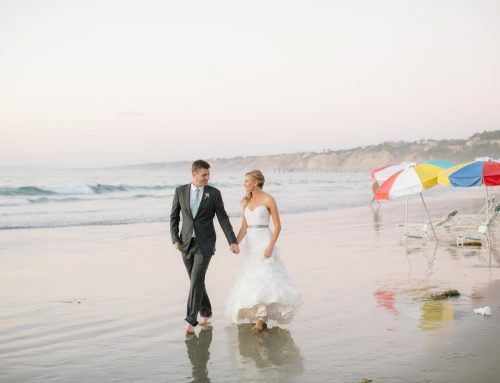 From the Bride, Amelia: We knew we wanted to get married in San Diego and the only requirement Adam requested when choosing a venue for our wedding was that it be at a beach location. He is a surfer and grew up in San Diego. Plus, we met, fell in love, lived together and got engaged all near the beach, so it was an important representation of our lives together. The Scripps Seaside Forum in La Jolla was the perfect venue. The relaxed setting and the breathtaking beach view was where we could envision getting married to each other and celebrating with our family and friends. When it came to the overall vision and planning of our wedding, I wanted each detail to be perfect and meaningful. We wanted to stay within our budget, which meant prioritizing was important and had to remember to keep things simple. We chose not to add much detail to the ceremony because the setting of the beach with the colors of our bridal party (suits, dresses, flowers, etc.) was enough. For the reception we tried to create an intimate and comfortable space that complimented the colors that were present in the wood building and the surroundings of the blue-grey ocean. I would call it a mix of modern and vintage with a touch of beach-y. I choose colors in gray, white, tan, silver, gold and blush and layered different textures such as soft satin, rough wood, embellished golds, shiny mercury glass, ruched chiffon and delicate lace. To set the ambiance, we chose a DJ that performed live music for the ceremony, cocktail hour and our first dance (which was one of my favorite moments.) Our guests saw us as dancing silhouettes just as the sun was setting and the waves crashed behind us. I had amazing vendors and help from my family and friends to get everything done. My mom made succulent arrangements from her garden and placed them in various planters she purchased. My florist used all the succulent arrangements along with vintage vases my mom had also provided and mixed them in with beautiful floral arrangements. My mom made our wooden signs, ring box and card box as well. The wood signs were made with recycled wood and white paint. My mom and her good friend provided the lace table cloths for my sweetheart and cake tables, which were family heirlooms. Friends and other family came over to help me cut invitations, tie twine on invites, print programs, tie ribbon on programs, paint bags for my bridesmaids gifts, write out names out the favors and anything else that I needed help with. Don’t you just love these pier shots? Since our company coordinates quite a few Scripps Seaside Forum Weddings, we ALWAYS get asked the question: “Should we really take the time to walk all the way down to the pier for photos?” My answer is always a resounding “YES!” Most photographers will take photos during your walk, and the pics are always to die for. I also like taking the entire bridal party down to the beach, and releasing them up to cocktail hour so the newlyweds can have a little private time and enjoy the sunset. Even if you do a first look, this is nice to do post-ceremony. While you will get a little sand in your dress, it can always be dusted off! Even with all the planning, there still were unexpected events that happened that really made me rely on the help of my family and friends. This came 11 days before my wedding when I cut my finger badly and needed 11 stitches. Luckily it was not my ring finger, and finding cute band aids designed by Cynthia Rowley made me feel a little better. The day of my wedding my each of my bridesmaids decided to wear a band aid on their finger in support of me, which is something I will remember forever and made for some cute photos. View their highlight reel, here! Below, you can see even more beautiful details from this wedding. Amelia and Adam, thank you so much for the opportunity! Working with you and helping you execute your vision was truly a pleasure! 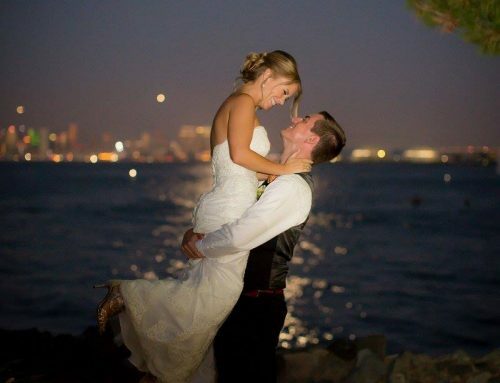 Nothing is more beautiful than a Scripps Seaside Forum Wedding…and your wedding is proof of this!